So sometimes when I dig through my files I find things that surprise me. This is one of those times. Waaaaay back in 2000 or 2001–when I still lived in Raleigh, NC–I came up with the basic idea that eventually turned into the Curveball Prose Comic Serial. I eventually abandoned it because I realized there was no way I could ever draw it, and I didn’t know anyone who would be interested in collaborating on it. So the idea sat for… oh… about ten years before I picked it up again. But today, as I was looking through my fiction files, I found the original script that I wrote when I still thought it might be a webcomic. And now I’m posting it for all the world to see. Liberty’s name was “Alexander Drake” instead of “Alexander Morgan.” Because, you know, if there’s one thing America’s all-star hero should have, it’s the surname of a dragon. The Guardians apparently used the guardians.org domain, instead of the fancy, non-existent, and rule-breaking .tti TLD. Johann Richter was apparently named “Friederich Kampf,” which is a ridiculously over-the-top name for a Nazi supervillain. Doctor AEvil was “Gears,” which sounds more like a character in a Nintendo game than a supervillain. It all took place in “Metro City,” which I’m pretty sure I stole from a role-playing game somewhere. I have to admit, though, I think I like the bank lobby scene in this script more than the one I wrote for Issue One. A spacious, high-end apartment overlooking the New York city skyline. It’s the living room, and one wall is glass. Sliding doors (which are currently open) open out into a balcony. At one end of the living room is a desk with a computer on it. Sitting in front of the computer is LIBERTY, still in costume, his mask pulled back revealing his face. He has the look of an older but still chiseled “All-American” — boyscout good-looks, but slightly graying temples. He looks to be about forty, though in exceptional shape. and that’s why I’m sending this to you. I’m sorry I put this in your lap, but you’re the only one I can think of that they don’t have their hooks into. The attachment explains it better than I ever could. Wish we’d had a chance to get that drink. LIBERTY stops typing and rubs the back of his neck. Close-up on LIBERTY’s face, as he stops mid-rub and his eyes narrow. Behind his head, two silhouettes can be seen, both armed. LIBERTY stretches again, reaching for a stapler. The silhouettes draw closer. They are UBERMEN 1 and 2. LIBERTY stands and spins, throwing the stapler square into the face of UBERMAN 1, cracking the faceplate of his helmet, while kicking his chair into the stomach UBERMAN 2 who drops his rifle. UBERMEN 3, 4, 5 and 6 can now be seen in the room, all armed. LIBERTY dives behind a couch as the four UBERMEN open fire, tracer rounds streaking over him. In the background UBERMAN 1 is trying to pry his cracked helmet off, and UBERMAN 2 struggles to his feet. UBERMEN 3, 4, 5, and 6 continue to fire, tracer bullets burying themselves into the couch, LIBERTY rolls up and flips the couch into the air toward them. It’s a heavy, leather-bound L-shaped couch – it should be apparent that LIBERTY is much stronger than a normal human being. UBERMEN 3 and 4 scramble out of the way, but 5 and 6 are propelled by the couch through the glass wall out onto the balcony. LIBERTY: I didn’t expect you boys till later. LIBERTY reaches down to his belt and removes two perfectly round silver spheres, slightly smaller than his fists, from his utility belt. He throws them, one at UBERMAN 3 and one at UBERMAN 4, both of whom are aiming their weapons. Both spheres hit them in their face plates with a loud cracking sound, and both are knocked down. UBERMAN 2 tries to shoot – his weapon misfires. LIBERTY turns and throws a third sphere, hitting UBERMAN 2 in the chest. UBERMAN 2 drops his gun and falls to his knees. UBERMAN 1 has finally removed his helmet. He looks like the Aryan ideal – blonde hair, blue eyes, clean-shaven, crew cut. LIBERTY runs up to UBERMAN 1 and shoves him into the wall. UBERMAN 1 grunts in pain as the wall cracks. LIBERTY lashes out with his foot at UBERMAN 2, who attempts to stand but instead flies across the room into UBERMAN 4 who was trying to stand one more time. Wide shot from the balcony, looking in at the carnage. UBERMEN 5 and 6 are sprawled unconscious on the balcony, one pinned under the couch which is lying upended on the concrete. UBERMEN 2 and 4 are collapsed in a heap just inside the apartment, and UBERMAN 3 is unconscious, in a sitting position, against an interior wall. The computer is still on, and LIBERTY is holding UBERMAN 1 against the far wall. LIBERTY: It makes me sad to see people wearing that uniform. Sad and angry. UBERMAN 1 is obviously in pain, trying to look defiant, and failing miserably. LIBERTY: (Angrily.) Do you even know what that means, boy? Do you really understand what that represents? Do you? LIBERTY: Of course you don’t. Too young. Too young. LIBERTY smashes UBERMAN 1 into the wall again. The cracks on the wall grow larger. LIBERTY: Now who sent you? UBERMAN 1: (Gathering all the courage he can muster.) No! LIBERTY smashes UBERMAN 1 into the wall yet again. A tiny red dot can be seen on the back of his neck. KAMPF: I sent him, Herr Drake. LIBERTY spins, letting go of UBERMAN 1, who collapses to the ground. Standing on the balcony is KAMPF, dressed in a uniform similar to the standard UBERMEN but with different symbols on the chest and wearing a thick, gray trench coat. He is not wearing a helmet – he appears to be in his late 40’s or early 50’s, with longish dirty-blond hair and a scar running across his forehead, around his left eye and into his left cheek. He is aiming a high-tech pistol at LIBERTY, equipped with a laser site, which now reveals that the gun is pointed squarely in the middle of LIBERTY’s chest. LIBERTY eyes the computer. The email is still open and unsent. KAMPF: (Smiling slightly, almost fondly.) Goodbye, Herr Drake. LIBERTY leaps across the room toward the computer at the same time KAMPF opens fire. Two bullets hit LIBERTY in the chest, ripping through his body. LIBERTY falls short of the computer and struggles to his knees, reaching for the keyboard. KAMPF advances on LIBERTY calmly, firing three more times. LIBERTY shudders, hand twitching, and manages to pull the keyboard down to the floor in front of him. KAMPF fires two more times. LIBERTY presses a key combination on the keyboard, and the open message on the computer closes, replaced with a dialog box. KAMPF fires two more times (9 shots in all). LIBERTY dies. Overhead view of the room. KAMPF stands over LIBERTY’s body, calmly reloading his pistol. KAMPF steps over LIBERTY’s body and peers at the computer monitor. KAMPF: I assure you, Herr Drake, that I understand precisely what it represents. The computer monitor shows a dialog box that says “Message Sent” with an OK button under it. KAMPF: What were you doing, Herr Drake? Sending a message? KAMPF reaches into his trenchcoat and puts on a wireless headset. KAMPF kicks LIBERTY’s body away and retrieves the keyboard. He is talking to someone over the headset. KAMPF: It is done. There is, however, a complication. KAMPF reaches for the mouse and clicks on the OK button. The computer screen immediately blurs. KAMPF: He was trying to contact someone. He appears to have succeeded. KAMPF: Hold on a moment. KAMPF begins to type, but the computer monitor remains blurred. KAMPF: I cannot recover it here. He has locked his machine. KAMPF: I can. But not here. It will take time. KAMPF: A few days. A week perhaps. It depends on how careful Drake was. I suspect he was very careful. KAMPF walks over to the balcony. KAMPF looks out over the city as we see the wrecked apartment behind him. KAMPF: Let us discuss the terms of this new contract. A busy city block. Tall buildings and lots of people and cars whizzing around. We’re looking at the outside of a bank, sometime in the mid to late afternoon. The sign over the entrance to the bank says METRO CITY MUNICIPAL BANK. Inside the bank a long line of people are patiently and impatiently waiting to interact with the one teller who is open (there are five other teller windows, all closed). The bank lobby is large, with marble floors and greco-roman columns. There are two security guards. The single teller and two security guards look a bit overwhelmed. Standing at the end of the line is CB. CB is a lean man in his late 20’s. 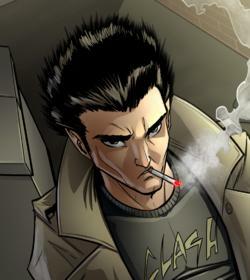 He is dressed in a long trenchcoat, black jeans, motorcycle boots and a t-shirt. His hair is dark and spiky, his face is clean shaven, he’s wearing sunglasses and looks either bored or hung over, perhaps both. CB is talking to CHARLES, one of the security guards. CB: Where the heck is everybody? CHARLES: Alice retired last night. Big party. CB pulls out a cigarette. CHARLES: CB… no smoking in the lobby. CB puts away his cigarette. CHARLES: Anyway, just the three of us today. You ask me, they should have just closed the place down. Can’t close a bank, I guess. CHARLES: Not that it would make much difference. This is always the slowest day of the week. Assuming there’s no trouble. The door – and much of the wall surrounding it – explodes inward, scattering bits of stone across the lobby and sending everyone in line scrambling for the far walls. Armed and armored men enter the room, firing automatic weapons into the air. CB and CHARLES stand in their original spot, looking on in mild surprise. MINION: Nobody move! Everybody does what they’re told, nobody gets hurt. Framed in the gaping hole at the entrance of the bank is a figure encased in battle-armor, a few feet larger than an average human and considerably wider. GEARS: Ladies and gentlemen, I am Gears. I am here to retrieve something from this bank. If you remain calm, no harm will come to you. Thank you for your cooperation. CHARLES: (whispering) CB… no smoking in the lobby. CB: What’s your policy on bank robberies in the lobby, Charles? CHARLES: That’s against the rules too. CB: Then I think you should work on your priorities. GEARS points at one of the empty teller booths. A cannon fires out of his arm, and the teller booth explodes. The teller behind the booths cowers in fear. GEARS: I detect that one of you has set off a silent alarm. That was… unfortunate. I’m afraid I’ll have to make an example of one of you… to prove that I’m not to be trifled with. CB: (Muttering) Trifled… right. (Raising his voice) OK, Mister… Gears, was it? Let’s see if we can cut to the chase here. GEARS: Can I… help you? CB: I dunno. I’m trying to make a deposit, and the line was bad enough before you got here. So if you could find your crown jewels, or the one-in-a-billion industrial diamond that you need to power your, uh, tinker-toy suit, or whatever it is that you’re looking to get out of this place… well, that would suit me fine. CB: Trifled with, yeah, I heard that. Look, not to bring you down or anything, but don’t you think you’re working the cliché just a little too hard? CB is now standing directly in front of GEARS, smoking and looking unconcerned. GEARS towers over CB. CB: Well let me try to make this simpler. You call yourself GEARS… let’s see… you’re a scientist, right? Or you were? And you built that suit, or a prototype, and your peers laughed at you? CB: Because it does look a little ridiculous. I’m sure technically it’s impressive, but come on. It looks like it’s made out of copper. All the cool super villains are going for your basic obsidian, perhaps with some silver, green or red lights. Do you have to worry about corrosion? I mean, if it is copper, I wouldn’t take it to beach. CB: But that’s beside the point. You built the suit, your peers laughed at you, and you promised to – let me make sure I have this right – you swore that you would “show them, show them all.” How am I doing? GEARS levels the arm-mounted cannon so it is pointed directly at CB’s face. CB looks at the arm-mounted cannon, then flicks his cigarette into the barrel. A popping sound comes from somewhere. GEARS’ arm shudders, and smoke wafts out of the barrel as CB looks on, unimpressed. CB looks up at the ceiling. The sprinkler system activates. CB: I hope you insulated that armor. There is the sound of something shorting. GEARS slumps over and smoke begins to rise from the entire suit of armor. CB looks around the room. Everyone is staring at him in shock, including GEARS’s minions. CB calmly walks over to the teller. CB: You all right, miss? CB: Good… (reaches into his pocket and pulls out a check) because I need to make a deposit.